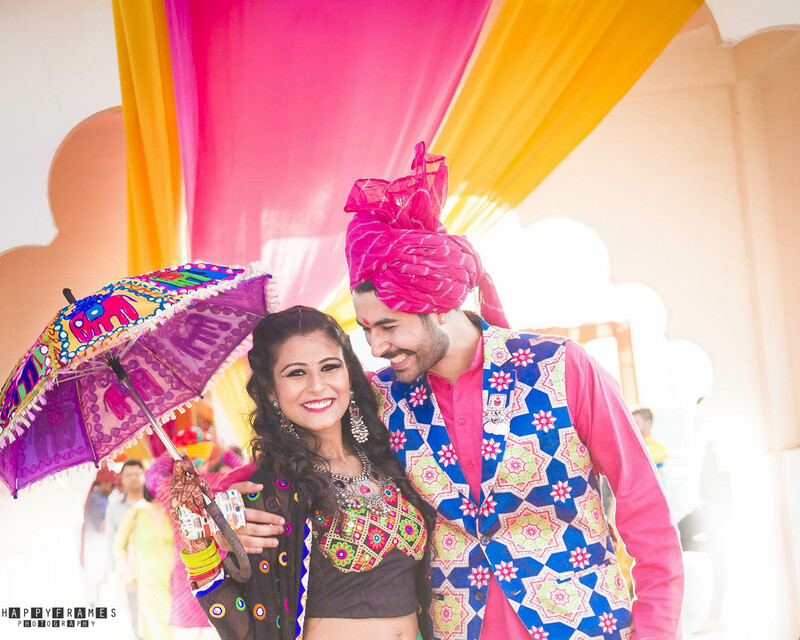 Apurva and Kanav’s wedding at Radisson Blu Palace and Spa, Udaipur was everything they had dreamed of. They had painted a picture of an unusual and fun destination wedding with their loved ones having the time of their lives. And trust us when we say they got just that and much much more. This designer duo custom made every little detail at their wedding. From the outfits, to footwear, to invites, favours and more, it all had a personalised creative touch to it. We loved how Apurva and Kanav based their wedding theme around two cartoon characters – ‘Coy’ and ‘Quirky’. They were basically designed keeping in mind the looks and personality of the couple, with Coy being Kanav (classy and modest) and Quirky being Apurva (bubbly and colourful). They aimed at showing the stark contrast between the two of them. Calling it ‘Rajasthan Ro Mela’, they created a colourful, Rajasthani mela set-up for their mehndi. Of course, the guests were all required to be dressed accordingly. Apurva wore a self-designed colourful contemporary-traditional outfit with mirror work and a sheer jacket-style cape. Kanav chose to wear a pink kurta with white dhoti pants under a printed jacket, accessorizing with a casual pink safa. The catering was authentic Rajasthani delicacies that were served by street-hawker like waiters. They even had fun mela games to add to the zing. Look out for Apurva’s gorgeous silver statement earrings by Amrapali and colourful Rajasthani umbrella! This was a sophisticated and elegant dance party with everyone dresses in formal gowns and tuxedos. The bride looked stunning in an elaborate white, off-shoulder ball gown with neutral floral prints which she designed herself. The topped off her look with beautiful diamond jewellery from Khurana Jewellers. The groom looked sharp in an all-black ensemble with a sheer panel and an A-symmetrical opening. The use of a telephone booth as a photo-booth was rather interesting and fun. The wedding day had Apurva looking beautiful in a deep green lehenga with elaborate mirror work and sparkly embellishment. She added a sheer dupatta with a matching glittery border and a gorgeous choker-style Kundan neckpiece by MB Jewellers that if you ask us, stole the show. Her make-up by Pink Floss was spot on. Notice the interesting eye-liner style! The groom fashioned himself in a white ensemble with green and red embroidery. He topped off his look with a beaded neck-piece and a safe that complimented the bride’s colour palette. The wedding itself was all things glittery and glamorous. Cheers to the team at Happy Frames for capturing all those amazing wedding moments!